: Mrs. Chris Seidler and Mrs. Elke Peper. Revised by Mrs. Renée Sporre-Willes. Official language (EN). : The Puli is a Hungarian herding breed of Asiatic origin. His original ancestors most probably came to the Carpathian Basin with the migrating ancient Magyars, who lived as nomads on stock-breeding. : Dog of medium size with strong constitution, square build and fine, but not too light bones. The somewhat lean body is well muscled all over. The construction of the individual body parts is difficult to judge, as the whole body is covered by a strongly developed coat, tending to form curls and cords. It is therefore useful to touch the dog when judging. The coat on the head is so profuse that the head appears round and the eyes are almost covered. The profusely coated tail, curled forward over the back, gives the appearance of the topline rising slightly towards the rear. The body length is equal to the height at the withers. The length of the muzzle is one third of the total length of the head. : Of lively temperament, extremely able to learn. Loves children and is an excellent watchdog. His present shape has adapted him to sporting use. : Seen from the front, round, seen from the side appears to be elliptic. : Small and fine. Superciliary ridges strongly developed. : Not pointed; bridge of nose straight. : Taut, with dark pigmentation. : Complete scissor bite according to the dentition formula (42 teeth). : Of medium size, dark brown, set in slightly oblique and medium wide apart. The expression is lively and intelligent. Rims of lids close-fitting to the eyeball and well pigmented. : Set on at medium height with broad base. The pendant leathers V-shaped with rounded tips. : Of medium length, taut, well muscled. Forms an angle of about 45 degrees to the horizontal and is covered by dense coat. : Straight. Giving the impression of rising slightly towards the rear because of the tail carriage. : Only slightly projecting from the topline. : Of medium length, straight, dry and muscular. : Very strongly muscled, short. : Deep, long with well arched ribs. : Gradually rising towards rear. : Set on at medium height and carried in a flat curl over the croup. Well covered by dense coat. When stretched out, it reaches to the hocks. : Shoulder blade sloping, tightly fitting to the brisket. A vertical line from the withers touches the front part of the chest at its deepest point. The angle between shoulder blade and upper arm is 100 to 110 degrees. : Medium long, well muscled. : Lying closely to the brisket. Angle between upperarm and forearm 120 to 130 degrees. : Long, straight, with dry muscles. : Short, rounded, tight with well-knit toes. Nails black or dark slate grey. Pads dark in colour and springy. Feet parallel, pointing forward and medium wide apart. : Not as tight and well-knit as front feet, otherwise similar. : The legs are medium wide apart and parallel. The angle between pelvis and upper thigh is about 100 to 110 degrees. : Angulation of stifle joint 100 to 110 degrees. : Very lively and spirited. Steps short. The gait is often typically mincing and jumping. The dog has a tendency to spin round himself. : Without wrinkles, tight, with strong pigment. The bare skin is black or slate grey in all coat colours. : The puppy coat is dense, wavy or curly. Later, there are tufts of hair developing to tassels and cords. The coat consists of a coarser top coat and a finer undercoat. The relation between these two types of hair determines the character of the coat. If the topcoat highly predominate the undercoat, the coat structure is untypical and the coat sticks slightly out. If the undercoat is too highly predominant – which is undesirable – this results in a matted coat of too soft texture, difficult to groom. The correct proportion between the two types of hair, which is genetically fixed, produces the aesthetical tassels or cords, which are easy to groom. The cords on the loin and the croup and at the back of the upper thighs are longest (20–30 cms). They are shortest on the head and at the limbs (10-12 cm). Coat on head is ideal when the hair forms a strong structure of cords covering the facial region. 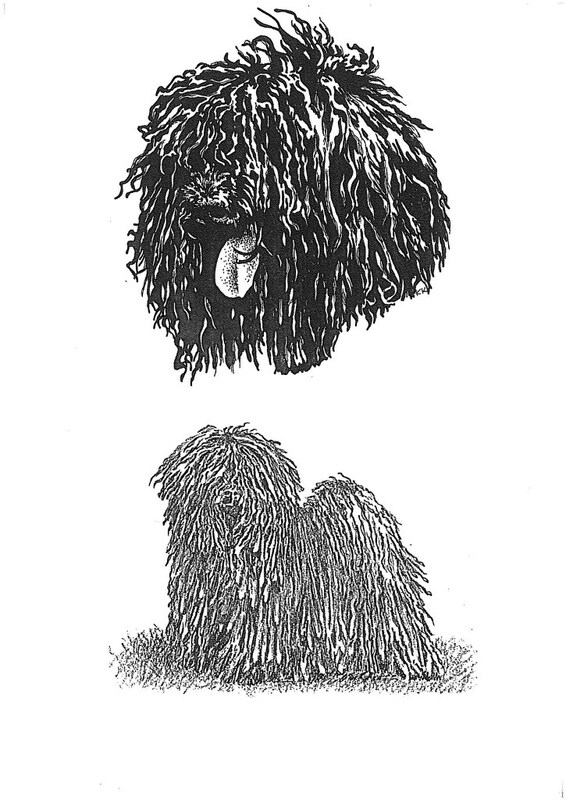 Both a combed out and a neglected, tousled coat are undesirable. Fawn (fakó) with a distinct black mask. A white patch at the forechest, not exceeding 3 cm in diameter, is permitted. White between the toes is not regarded as a fault. Pearl white coat, without any russet gold (semmelblond). Males 39–45 cms, Ideal height 41–43 cms. Females 36–42 cms, Ideal height 38–40 cms. : Males 13–15 kgs. Females 10–13 kgs. Over- or undershot bite, wry mouth. Tail carried in sickle shape or horizontally. Short or smooth coat, separately growing hairs. One or more missing teeth (incisors, canines, premolars 2-4, molars 1-2. More than two missing PM1.The M3 are disregarded.